Original or "home-made" Spellfire cards have been around as long as the game has. Several special TSR cards were produced by people in the art department as part of the company's annual "Tacky Christmas Gift Exchange." Some examples of these cards may be found here. This card, aptly entitled "Blackmail!," is the only known RPGA card. The card text reads as follows, "Present this card to RPGA Coordinator Scott Douglas to gain one favor. If he refuses, he must sing to you the theme from Gilligan's Island and Barney's theme song. If he refuses this request, you retain this card. If he complies, give the card to him." My "Blackmail!" card is signed by Scott Douglas. I have no idea who wrote this card, nor why Scott is dressed as he is. Anyone with more info on this card, please let me know and I'll send you something nice for your trouble. It's everyone's favorite boss, James M. Ward, as The Ugly Princess. This card was created by Kevin Melka as a Tacky Christmas present for everyone in the Creative Services Department. The card text is as follows, "The Ugly Princess. The charisma of the Ugly Princess is far below normal. If this champion ever meets Mayor Charles Oliver O'Kane in battle, however, the two of them are placed in the Abyss and live happily ever after. 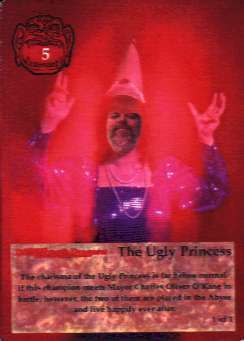 Jim was the target of this abuse because he picked on Cindy Rice, who posed for the Fair Princess in the Runes & Ruins Chase set, about her card. We had trouble enough finding people around the office to dress up in these stupid costumes for Spellfire cards without James annoying our models, hence The Ugly Princess. These two cards weren't the only TSR-only cards. There were two more that I know of. One was a holding called "The Shrine of the Cheese God" and I think the other was just called "The Cheese God." Of course, this was before my time at TSR and I could be wrong. I don't know the specifics of the two cards, but one was given to Bruce Nesmith and it was incredibly powerful. The other was given to everyone else in the company. That one, of course, totally negated the first card. It was also a Tacky Christmas Gift. If anyone has any information on either of these cards, please let me know. 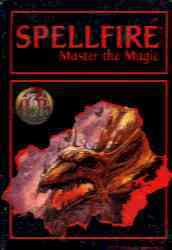 Fan generated Spellfire cards were available at the 1996 Gen Con Game Fair. For a fee, fans could raid the TSR costume and props locker, dress as their favorite character from their home AD&D campaigns, and create an original, playable Spellfire card. What can I say? It was a huge success and kept the people at the Spellfire Booth among the busiest at Gen Con. The plan was that the best of the home-made cards would be used as actual chase cards in upcoming expansions. The first 25 of those were incorporated into the Dungeons! Booster. Because of the acquisition of TSR, Inc. by Wizards of the Coast, we may never see the rest of the fan cards. If you made a card at Gen Con that year, or know someone who did, please send one of your cards to me so I can scan it and put it here for all to enjoy. I'll return the card, or let you count it as a Chase in a trade. I'd like to get as many of the original cards posted here as possible.